A Utah home and its guest quarters are a study in beauty and simplicity. 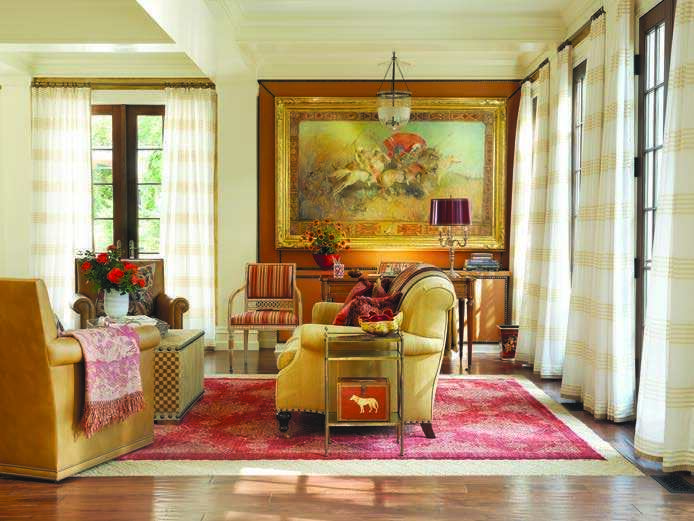 A HOUSE PERCHED HIGH in the Wasatch Mountains, overlooking Salt Lake City and the Utah Capitol, presented designer Marshall Watson with a pressing challenge: how to create a cohesive look for a home that had been adorned in an assortment of styles. The original house is a Decoinspired concrete structure built in the 1940s, but over time, the addition of a large plantation-style porch and decorative motifs reminiscent of ancient Egypt had resulted in a mismatched look. The look would influence design decisions for the home both inside and out. In the main house, Watson and his team from Marshall Watson Interiors, headquartered in New York City, designed an open-floor plan with a kitchen, an office, and a family room in a palette of coral, gold, and tan drawn from the colors of the marble inset in the fireplace mantel. An oversized sofa, two club chairs, and a checkerboard wood-and-fabric ottoman anchor the seating space. Above the mantel hangs a landscape painting from the client’s art collection; built-in cabinets flanking the fireplace conceal a television and provide storage space. On the floors, Watson layered sisal and a custom silk-and-wool rug to create a stylish yet family-friendly look. “This combination helps center the room and makes the seating area feel more intimate,” he says. 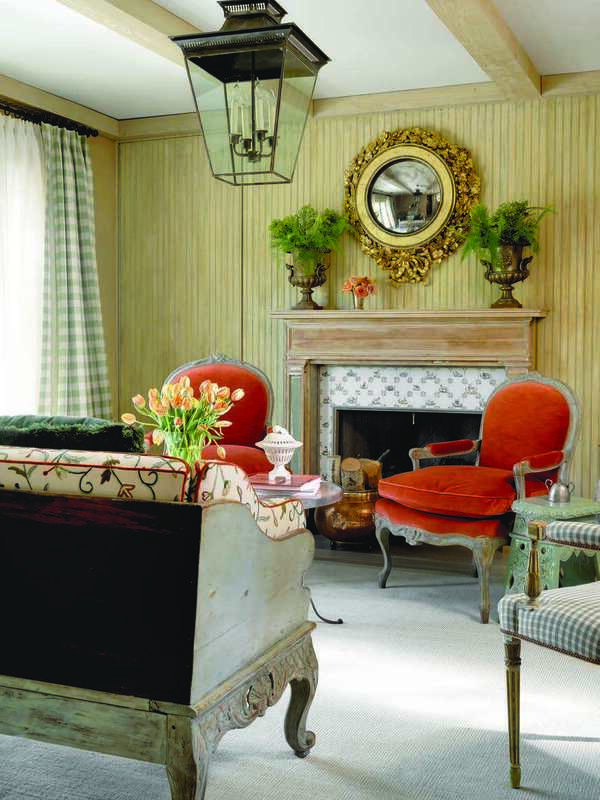 Judy Mulligan of Judy Mulligan Inc. created the faux finish on the walls to imbue the room with an Old World feel. She applied a caramel glaze, then glued wet tissue paper on the walls to achieve a crinkled finish. To set the look, she applied another coat of glaze over the paper. Adjacent to that room is the homeowner’s workspace, where a painting depicting Native Americans on horseback is paired with an English antique desk, upholstered in leather with nail head detail. Two guest bedrooms invite visitors to relax and make themselves at home. In one, a French Empire–style bed and two bedside tables add elegance and panache. 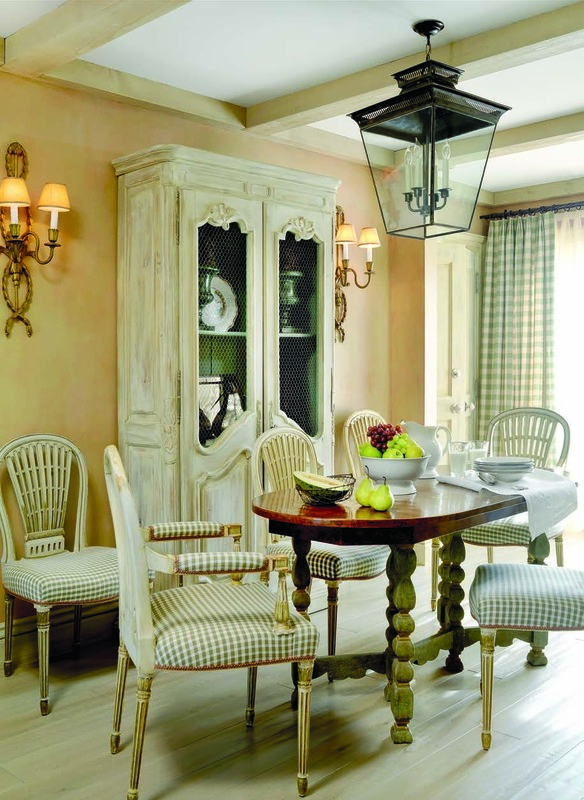 When lit, the matching alabaster lamps set the room’s glazed walls aglow. A custom carpet and antique leather trunk rest on the floor. Above it all, the ceiling is papered in TylerGraphic’s Celestial pattern, based on a 17th-century map of the world. 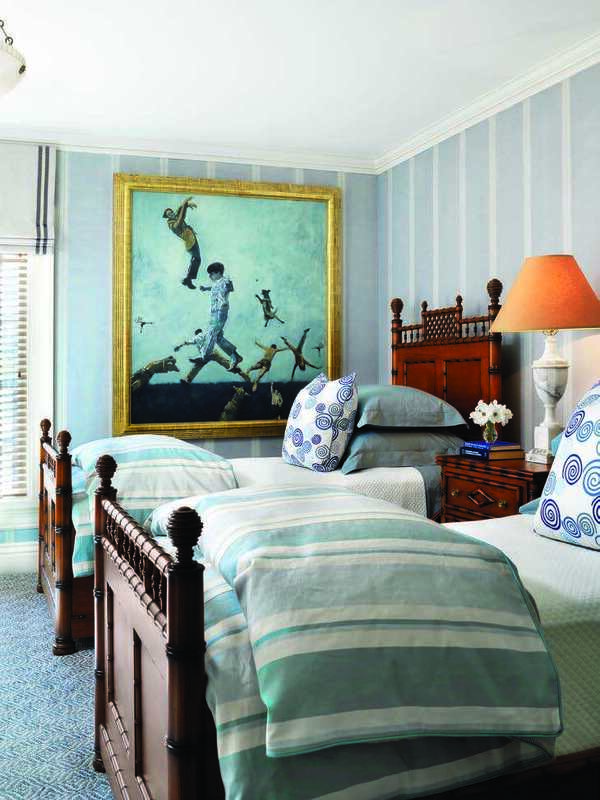 The blue-and-white design scheme in the second guest bedroom is based on a large, whimsical painting from the client’s collection. Stripes on the wall, fanciful details on the pillows, and a diamond pattern in the carpet complement the sense of movement in the painting. The twin beds’ custom French faux-bamboo head- and footboards, along with the bedside chest, give the room enough formality for adult and young guests alike. In the guest bathroom, the look is classic 1940s style, with stipple-glazed walls, glass tiles, and a large floor design with a checkerboard of Turkish marble and cream stone tiles edged in glass tiles. 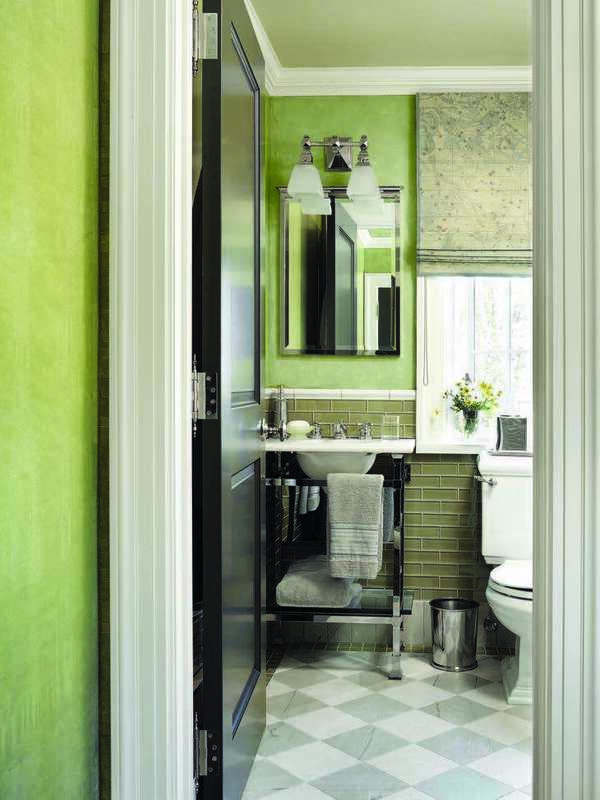 Watson selected an open marble, chrome, and glass vanity to make the small guest bath appear larger. “A solid vanity would have made the space feel too crowded,” he explains. Built above the main home’s detached garage, complete with a balcony offering expansive views of the lake and the Capitol, is the guest house. As they enter, visitors are welcomed by a Swedish Mora clock that sets the stage for the re-creation of a Swedish cottage in the mountains. “We chose a classic Scandinavian influence for the guest house because the look complements the main house but with a bit more romance,” says Watson. Checkered fabric on the drapes and reupholstered antique chairs in the dining room acknowledge the traditional Scandinavian use of simple, thrifty cottons and linens. Plaster walls in a soothing cantaloupe color warm the space, and the pine floors have been stained with gray paint to mimic the look of the floors in Swedish homes. To achieve a worn look, Watson had the floors bleached, then covered with a thin gray stain and glazed in a gray-white finish. The client’s French hutch and gate-leg table were also refinished in the Swedish country style, which is often painted in a matte finish. In the main living space, an 18th-century Swedish pull-out bed was converted into a sofa. Swedish Rococo–style chairs were repainted and reupholstered in orange velvet for a punch of color. A Swedish carved-wood bull’s-eye mirror, painted gold, hangs above the antique mantel. 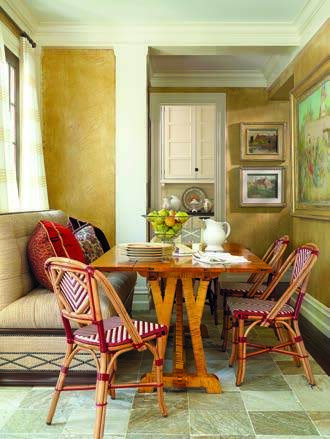 The room’s beadboard was given a strié finish to mimic the appearance of walls that have aged over centuries. In the guest quarters and throughout the main house, the design sensibility calls to mind the past, while incorporating the comforts of the present.